There are many types of prayer wheels. The most common type is the small, hand spun one. But there are wheels placed on a tabletop or where they can be spun by wind or by flowing water in order to continuously use nature's elements to spread blessing. Smaller mounted wheels can be spun by the heat rising from a flame or by steam from a stove. Nowadays even motor driven prayer wheels are built. Our wheel can be reached and spun from anywhere in the world, through internet. So it becomes a community prayer wheel. 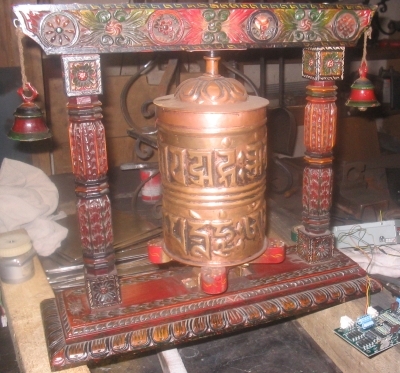 The properly consecrated prayer wheel - originated from Tibet - is donated by The Gate of Dharma Buddhist Church. We have only added a few things to it, so it became the world's first internet operated prayer wheel, with its own IP address. Just click and watch the wheel turning! Every turn of the cylinder equals the sounding of all the mantras written on the paper-rolls put inside.